Arum Maculatum. By some it is called Aron, Arum, Ramp, Starchwort, Cuckow-pint and Wake- Robin. It sends forth three, four, or five leaves from one root, each large and long, broad at the bottom next the stalk, forked, ending in a point, of a full green colour, each standing upon a thick round stalk, 4 to 6 inches long, among which, after two or three months that they begin to wither, rises up a bare, round whitish green stalk, spotted and streaked with purple, higher than the leaves: at the top of which are long hollow husks close at the bottom. 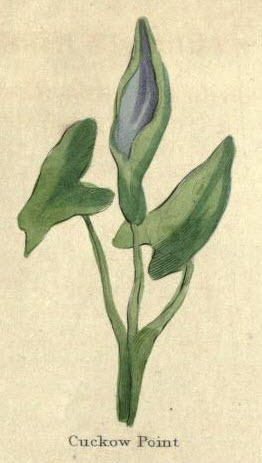 but open from the middle upwards, ending in a point; in the middle whereof stand the small long pestle or clapper, of a dark purple colour, as the husk is on the inside, though green without, which, after continuing for some time, the husk with the clapper decays, and the foot thereof groweth to be a small long bunch of berries, green at first, and of a red colour when ripe, of the size of a hazel-nut kernel. They look very tempting, but are highly poisonous, as indeed the whole plant is. The root is round and long, of the size and shape of a walnut, externally brown, and white internally, and of a sharp acrid taste, and so is the whole plant. The root was anciently used instead of starch. There is another sort of Cuckow-point, with lesser leaves than the former, and sometimes harder, having blackish spots upon them, which for the most part abide longer green in Summer than the former, and both leaves and roots are more sharp and fierce than it: in all things else it is like the former. These two sorts grow under our hedges. The root is the part used. It is a good medicine in palsies. Half of one of the roots, fresh gathered and bruised, will sometimes restore the speech at once; if not, repeat the medicine. It is also good in scorbutic cases, and in all inward obstructions. Half a pound of the roots, 1 Alb. of Sugar, beaten together in a mortar, is the best way of taking it. Take a drachm at a time. This is good for the above diseases, for gout, and severe rheumatism. An electuary made of the root and sugar is good for difficult breathing, coughs, and affections of the chest. The juice of the leaves is good for Polypus in the nose. The water, in which the root has been boiled, dropped into the eyes, frees them from film or mist which hinder the sight, and also cures the eyes when inflamed. The root mixed with bean-flower, and applied to the throat or jaws that are inflamed, cures them. The juice of the berries diluted with a little water, and dropped into the ears, easeth pains in them.